Today we started our journey to ‘Copiapoa Country’, aiming to get to the Parque Nacional Fray Jorge, traditionally regarded as the southern limit of genus Copiapoa, although the furthest southern occurrence reported is probably Ritter’s FR 504 (C. pendulina) from Puente Teniente, some 40 km further south. Ruta 5, the Pan Americana (Pan American Highway) provides a fast and smooth alternative for our journey north (and later back south again) to Ruta 1, the coast road which in places is little more than a badly maintained dirt track. North of La Ligua, the road turns to to North West until it meets the Pacific Ocean at Caleta Pichicuy. We passed Los Molles, Pichidangui (visited on the way home, S107) and decided to stretch our legs at an emerging summer residence village at Punta Totoralillo – S002, where local fishermen have changed their occupation to offering boat trips along the coast. After a petrol stop at Los Vilos, we made another leg-stretch break at Caleta Chigualoco, but other than hillsides full of Trichocereus, found nothing of interest to the cactus tourist. North of Caleta Teniente, the Pan Americana turns back inland and crosses the Rio Limari, which, nearer the coast, forms the southern border of the Fray Jorge National Park. Finally we saw the signpost west and followed the 18 km of good unpaved road to the entrance of the Park, making an unscheduled stop, S003 just before the entrance. There is no reason why all nice cacti should grow inside the boundary of the Fray Jorge National Park! So when Marlon spotted a bright red fruit on a Eulychnia acida, the time was right for a stroll along the road.to examine these plants and the much smaller Cumulopuntia sphaerica with its bright flowers. There are two species of Echinopsis (Trichocereus) species: E. chiloensis and E. skottsbergii, but to this date I have difficulty in deciding which is which. 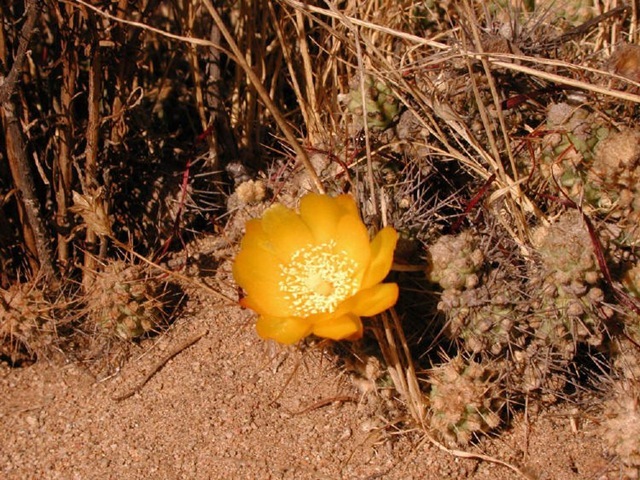 Cumulopuntia sphaerica (that we carried on calling Tephrocactus berterii) was probably the most widely distributed cactus that we encountered although there were only few occasions when it seemed worthy of having its picture taken – usually it was dehydrated and covered in dust. As a result, we often omitted to report it in our stop list, so it is mentioned only if it can be spotted in pictures taken at that stop. The surprise of this stop was Eriosyce aurata fa. sandillon – a rather rare and difficult plant in UK cultivation. Because of this reputation, we somehow had expected that it would also be difficult to find and rare, but this was not the case. Groups of five to ten plants, growing a meter (c. 3 ft) apart could easily be found. Unfortunately, National Parks in Chile only open at the weekend out of the main holiday season, so when we arrived at the gate on Friday afternoon, we found the gate locked. Not deterred, we went back towards Ruta 5 for another look along the road side, S004, near our previous stop. Here we found other groups of Eriosyce aurata, with large woolly fruits. We admired the large stands of Eulychnia that looked in remarkable good health compared to the stands that we were to see later during the trip. Only a few minutes before the stop, we asked ourselves if we should be careful about snakes in this area. Somehow we concluded that there were no snakes in Chile. Ironically, I stumbled across a snake soon afterwards, sunning itself in the afternoon sun. It only waited long enough for me to take its picture before racing off into the bushes. Was it poisonous? I’ll never know. Our reason for visiting Fray Jorge was to see the most southern Copiapoa that grow in the park. Unfortunately we believe that we did not find these plants. Plans to return on the Sunday before our flight back home did not come to fruition – there is only so much that can be fitted into a four week trip. We continued north on Ruta 5 until it seemed sensible to look for accommodation, which happened to be in the seaside village of Guanaqueros, where for 20,000 pesos (about £25) we found room at Cabaña Bahia Club for four of us. All in all it had been a great way for me to spend my birthday, finished off with an excellent sea food meal at the local restaurant, washed down with Chilean red wine.